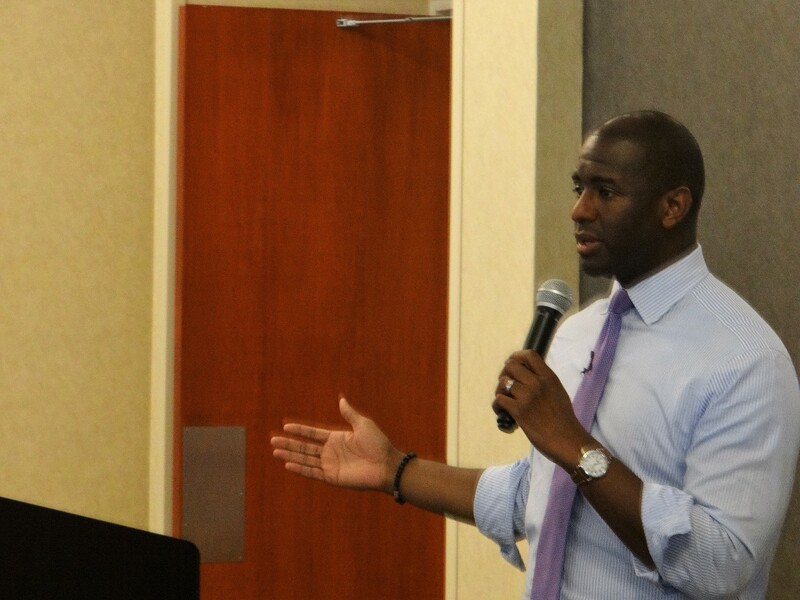 Tallahassee mayor and Democratic gubernatorial candidate Andrew Gillum spoke before the College Democrats Thursday night at the Live Oak Ballroom, promising a more progressive direction for the state of Florida. Gillum, 38, spoke for more than 20 minutes before an audience of several dozen people, outlining his differences between himself and Republican Gov. Rick Scott, particularly on climate change. “We deserve a governor who recognizes sea levels are rising and climate change is real. Don’t believe me? Go to Miami Beach on a non-rainy day and see them close the streets due to high-tide,” he said. He also highlighted the need to “take the shackles off” public education by ending standardized testing. In the platform found on his campaign website, Gillum also calls for the creation of high school vocational training programs, which would integrate computer education into the curriculum. “We shouldn’t say your life is over because you’re not going to a two-year or a four-year university. We should equip you with a skill you can monetize so you can go to work and take care of your family,” Gillum said. But while Gillum’s policy ideas drew applause from a largely Democratic crowd, one attendee openly took issue with what he believed was the mayor’s divisive rhetoric. “He has uniquely united reasonable-thinking people on the left and on the right to oppose his hatred, his vitriol, his division, his derision and his inability to be an adult. He has shown he is uniquely unqualified to be in his position, and I say that without apology,” Gillum responded. “I’m against him on issues like public education. As someone with special needs who could have only succeeded with a private education, I understand that public education fails students like myself,” Hartman, who has autism and bipolar disorder, told Knight News. Following the speech, Hartman followed up with his critiques on Twitter, calling Gillum divisive and accusing him of lying throughout his speech about Trump and Republican reactions to Trump. Disappointed at how divisive @AndrewGillum was at @DemsUCF. But at least he was honest at his division. So I’ll give him that. Plus, so many lies. Why do so many leftist politicians like lies? I will write an article debunking some of those myths. In a post-speech interview with Knight News, Gillum addressed Hartman’s concerns, but without much specificity. “Without having complete knowledge of that young man’s circumstances, we have a constitutional responsibility to provide education for all kids. And if that mandate is not met in any one of our counties, we have to figure out why,” he said. Still, Gillum found many supporters in the audience, including Russell Drake, the First Vice President of the Democratic Black Caucus of Florida. Florida has not elected a Democratic governor since 1990, when Lawton Chiles won with more than 55 percent of the vote. And while Gillum’s policies are more liberal than the establishment wing of the party, Drake says that voters will gravitate toward the campaign’s message. “There’s something about having passion, vision, drive and a plan,” Drake said. “A lot of people are out of touch with state and local politics and this is one of the ways to get students acquainted with politicians and candidates,” she said.